Free Shipping Included! Active Stylus Pen, Ciscle Electronic Stylus, 2 in 1 Precision Series with 1.6mm Fine Point Copper Tip and Mesh Tip, for Touch Screen Devices (iPad/iPhone/Andriod or More) -Rose Gold by Ciscle at Pacs BG. MPN: Ciscle20180124. Hurry! Limited time offer. Offer valid only while supplies last. [FLEXIBILITY AND UTILITY] The Ciscle Stylus Pen can operate with high sensitivity on most touch screen devices, providing an accurate and smooth work experience ideal for writing, drawing, and note-taking. 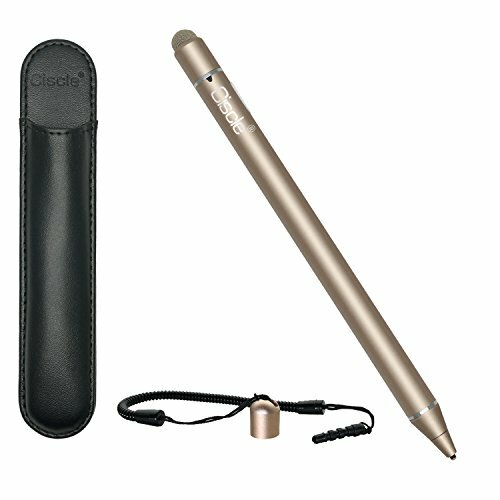 [WIDE COMPATIBILITY] The Ciscle Stylus Pen is compatible with most touch screen devices. Including, iPhone, iPad, iPad mini, Samsung tablet, Android Phone, LG ..... Note: not compatible with Windows system. [RECHARGEABLE] The stylus provides efficient power management and lasts approximately 12 hours after fully charged via Micro USB cable in about 1 hour. NO Bluetooth or APP connection is required to operate the stylus. [2 IN 1 DESIGN] The copper tip provides the user with enhanced and accuracy when drawing or writing. While the fiber tip offers smooth and soft functionality, especially when the stylus is power off. [WARRANTY] We offer customers 24/7 online support, a 100% Money-Back Guarantee, a 1-Year Replacement Warranty, kindly contact with us if there is any quality issue.